Tattoos can be a beautiful human expression but as our lives change, tattoo regret takes over. Erase unwanted tattoos and pigment with PicoSure Laser, the most advanced laser treatment available for safe and effective tattoo removal. The PicoSure Laser targets unwanted ink more effectively than any other laser, successfully removing difficult ink colors, such as blue and green, as well as previously treated tattoos. Fewer treatments, improved recovery time, and faster results are achievable with PicoSure Laser’s groundbreaking picosecond technology. At Skin Deep Laser MD, we have upgraded our PicoSure technology to include the revolutionary 532 picosecond wavelength – making our PicoSure treatments the best on the market for removing red, yellow and black inks that can be difficult to remove with other lasers. Complete removal in less than half the treatments of any other laser, guaranteed! 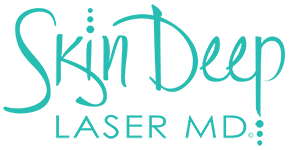 Skin Deep Laser MD now offers treatment package financing through Care Credit. Is your tattoo holding you back? Many people are finding their tattoos harming them in their career or socially. Many employers, including the military and civil servants don’t allow visible tattoos. It could be that you have just outgrown your tattoo. Whatever the reason, Skin Deep Laser MD’s revolutionary PicoSure Laser can remove tattoos in the safest and most cost efficient manner. While you may pay more for each PicoSure Laser treatment compared to the older Q-switched laser treatments, the PicoSure targets all ink colors in one treatment. It can remove tattoos faster than any other laser with minimal damage to the skin. With PicoSure, tattoos are removed in fewer treatments, with less discomfort and lower total removal costs. How does the PicoSure Laser Tattoo Removal Work? The PicoSure Laser is the newest tattoo removal technology on the market. The laser energy is delivered to the tattoo, targeting only the ink and shattering it into tiny particles. Your body eliminates these tiny ink particles through natural processes lightening your tattoo. The PicoSure Laser can remove any color tattoo. Older tattoos lighten faster and new tattoos will take longer. Difficult ink colors like green and blue or previously treated tattoos can be effectively removed with PicoSure. How many treatments will the PicoSure take? With the PicoSure Laser, you will see better results in less treatments. During your free initial consultation, you will fill out a medical history and our clinician will ask specific questions about the tattoo. We will recommend a treatment plan to achieve optimal results. How long between treatments and why do I have to wait? We generally try to schedule treatments at least 6 weeks apart. We have to allow your body to heal and eliminate the ink particles. Treating before the skin is fully healed could put you at a much higher risk of scarring. Will I see results after the first PicoSure treatment? Each patient and tattoo responds differently. Often depending on the age of the tattoo, you may see a significant difference after one treatment. Newer tattoos will probably require more treatments to start seeing the ink lighten. What are the Pre- and Post-Care Limitations? We recommend patients avoid sun exposure to the tattoo for 1-2 days prior to treatment. After treatment, we ask patients to avoid physical activity for 1-2 days to avoid irritating or damaging the treated skin. After that, patients can go about their daily routine, but should avoid intense sun exposure until the area is completely healed. When in doubt, don’t hesitate to call us.